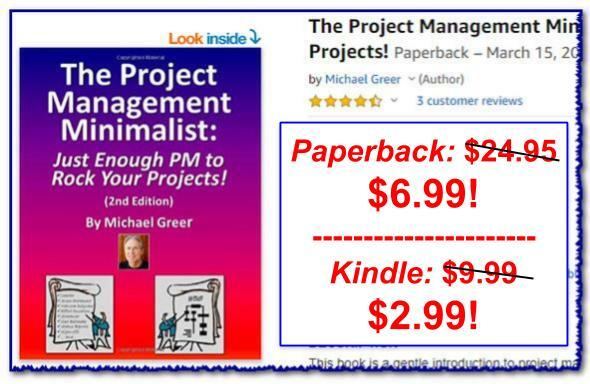 Mike Greer's WORTH SHARING: Got Thinkus Interruptus? Here are 5 specific actions to clean up your cluttered consciousness. 1. 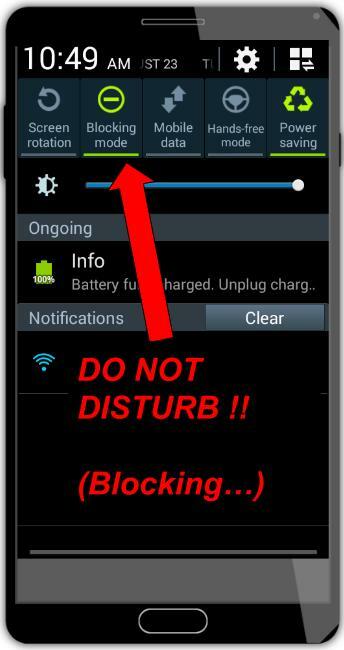 Set up your device's "Do Not Disturb" feature. good night's sleep. In the daytime, if I'm working on a complicated piece of writing, I set up the electronic barriers to allow a decent chunk of time for uninterrupted concentration. So decide on some time periods you want to be left alone to concentrate, have quality time with someone or simply enjoy some "me time," then mute your device for those time periods. 2. Keep a Focus Diary. I recommend a simple paper and pencil list, as shown above. It's easy, portable and is less distracting than fooling around with an app. 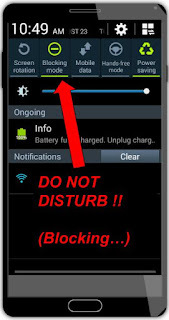 Better yet, because it's not electronic, it just sits there quietly waiting for your entry -- no click, tap or swipe needed and no intrusive notification tray nagging at your consciousness! However, if you must use your phone or tablet for this analysis, you might try one of the many time tracking apps out there. I'd recommend aTimeLogger, available for iOS and Android devices. It's super simple, customizable and includes lots of icons that allow one-click logging of an activity. 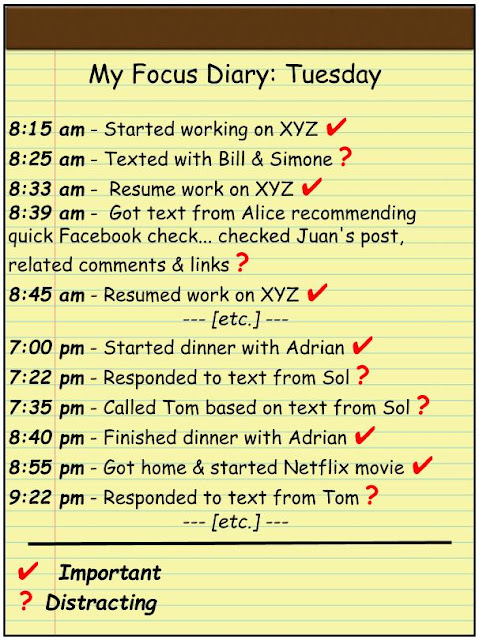 3. Review and analyze your diary entries. After you've logged your entries, review them and decide which items are the most important (i.e., enjoyable, fulfilling, valuable, productive -- how ever you define important) and which are questionable or downright distracting and time-wasting. It's helpful to distinguish these with a check mark (important) or a question mark (distracting) as shown in the example. Then decide whether you want to assert some control over your schedule... and if so, how you are going to do it. 4. 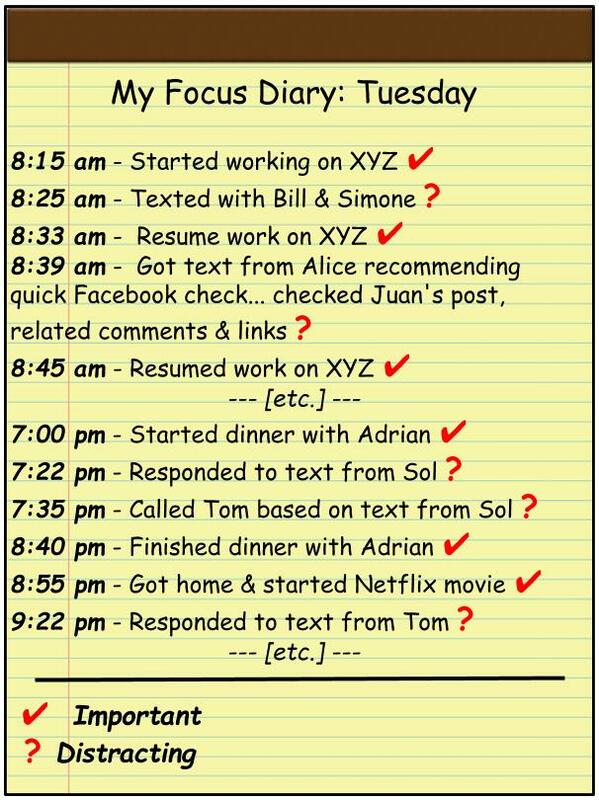 Set up specific times for texting, email and phone calls versus specific times for getting into a productive (or pleasurable) "flow" state. You might want to set aside a blocks of time during the work day when you return emails, voice calls and texts. Then, outside those specific times, you would block calls and texts and ignore emails. Simply let them accumulate and focus on a specific chore. In fact, just knowing that your call/text/email time will roll around in an hour or so can really help you relax and concentrate! Or you might want to set aside a couple of hours each evening as "movie time," during which you could block calls & texts and let yourself get lost in the movie. Before and after "movie time," you could be available for digital interactions. In fact, one tech podcaster I know comes home from work, shuts off his phone, places it on the refrigerator -- out of sight, out of mind -- and makes the entire evening family time. He reports that since starting this practice his relationships with the wife and kids has much improved! Here's the bottom line: People calling you and texting you are doing so on their terms... when it's convenient to them. Doesn't it make sense that you reply to them in similar terms -- when it's convenient for you to do so? 5. Meditate and LOWER your tolerance to interruptions. Meditation can help you discover just how much time you spend flipping through your mental "To Do" and "What if..." lists. In the silence of your eyes-closed, meditative state, the items on these lists may bombard you, allowing you to see them for what they really are -- just noise. 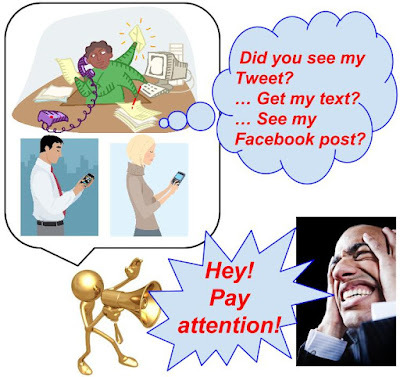 With a little practice meditating, as you acquire a more focused and peaceful consciousness, you are likely to become less tolerant of time you spend anxiously checking, feverishly responding, nervously clutching your device and waiting for the next "ping" from someone... anyone! If you do decide to learn to meditate, you'll be in good company! All sorts of folks, from Albert Einstein to Mick Jagger to Bill Clinton to the Dalai Lama have regularly practiced meditation. And successful companies as wide-ranging as Apple, Nike, Deutsche Bank, Procter & Gamble and Google (among many others) actively encourage the practice by their employees. It's up to you: You have to decide that you are in charge of your consciousness and assert your control over it. The alternative is to allow your awareness to be knocked all over the place by other people -- and in the process to become ineffective, frustrated and a generally irritating person to spend time with! So is this the day you finally take charge of your "thinkus interruptus?"